Jerguson® Gage and Valve is a Clark-Reliance company supplying level gage glasses, magnetic level gages, liquid level switches and transmitters. 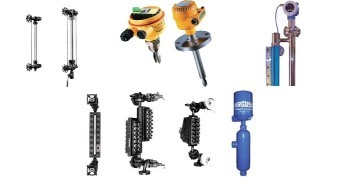 Jerguson gages and valves have been installed on a wide variety of liquid level applications. Jerguson recently introduced External Cage Level Switches, Displacer Level Switches, Displacer Transmitters, Tuning Fork Switches, Ultrasonic Gap Switches, Non-Contact Ultrasonics as well as Capacitance Switches and Transmitters. Jerguson’s history with Mead O’Brien dates back to being an original product line with O’Brien Equipment Company in 1927.